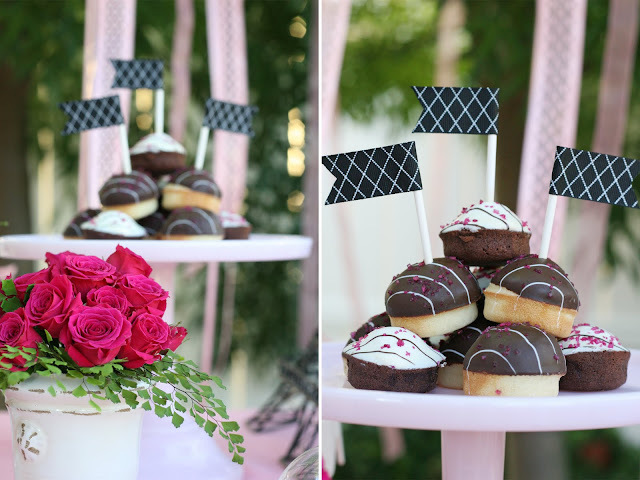 Last week I had an idea for a dessert table that I just had to bring to life! So I pulled out some of my cake stands (some of my favorite worldly possesions! ), looked through my ribbon (another huge love! 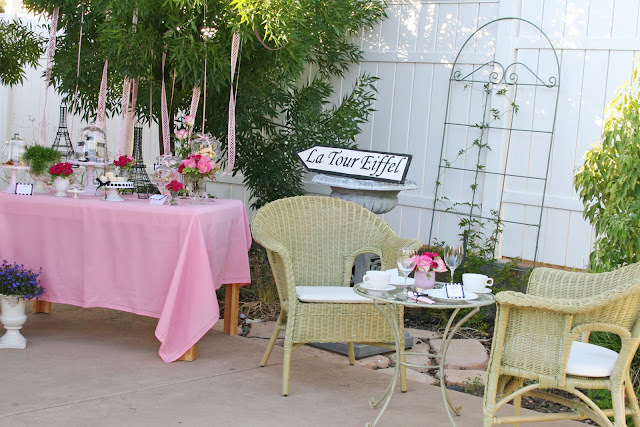 ), and set up a “big girl” version of a play tea party. I started with some desserts from Donsuemor bakery, pretty little Cute Cakes, Madeleines and French Almond Cakes. I baked up some mini Chocolate Raspberry Tarts (recipe soon), got to work on some pretty food tags, and went shopping for a few more treats to add to the table. Then I called up a friend and asked her to join me for coffee and some desserts after dinner. We sat in the backyard, listening to french music, chatting and enjoying fresh fruit, iced coffee, and lots of pretty desserts. Above ~ Chocolate and vanilla “cute cakes” from Donsuemor. Accented with homemade ribbon flags. Above ~ Homemade Chocolate Raspberry Tarts (recipe soon), and Vanilla Macarons (Trader Joes). I bought some pretty roses (from Costco) and arranged them with some maidenhair fern (from my neighbor’s yard) in a variety of small vases. 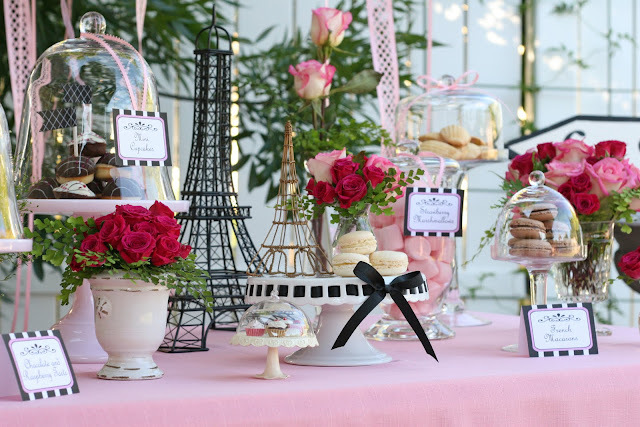 In case you’re wondering… yes, I already had the “La Tour Eiffel” sign, and the three metal Eiffel towers on the dessert table (two black and one small gold). I’ve never been to France, but it’s on my “must see before I die” list. Until I can afford to go, I’ll keep collecting a few things to remind me of my “someday” destination. That is the most beautiful party ever. I just love the colors and the treats. Totally inspiring! That is beautiful. So amazing what you can do with a few things around the house. Big girls do need treats. Must have one for me and some friends soon, just because. Lovely inspiration. It's all so pretty! On my list of things to do before I die…travel to the USA & have a tea party with Glory! Hehe! Your talent is incredible! This is gorgeous…perfection. omgosh! so pretty! im craving all of the desserts! My invitation must've gotten lost, because I surely would've been there! Wow, this is really lovely Gloria!! Oh my goodness. This is just so sweet and special. I love it! Absolutely love it. So beautiful. I love all things Paris. Wow! I love the way you took the pictures… so perfect! Next time you get a great idea – call me! Ok, just give me a few days and I am there. Need to arrange passport (yet to travel OS :O ) Then purchase ticket. Can you collect me from Airport? I will bring Sharnel too. Loved it. That is so beautiful. U r very creative. For the sake of having fun take the Dessert Personality Test and find out your personality on the basis of your favorite dessert. I have taken the test and have enjoyed a lot. Hope you too will enjoy it. Have Fun!! This is just GORGEOUS!! The cake stand collection is quite lovely. This is gorgeous! I just featured this and your hydrangea cupcakes on my blog today. You rock! Very beautiful and so cute. 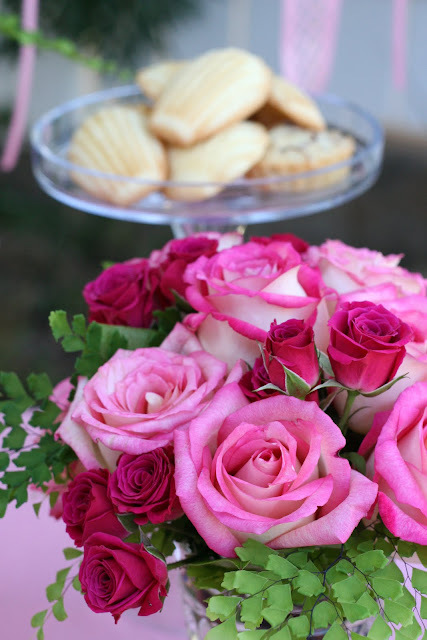 Beautiful and I love the way you incorporated the Donsuemor treats, they are delicious and so pretty. The pictures are trully inspiring. 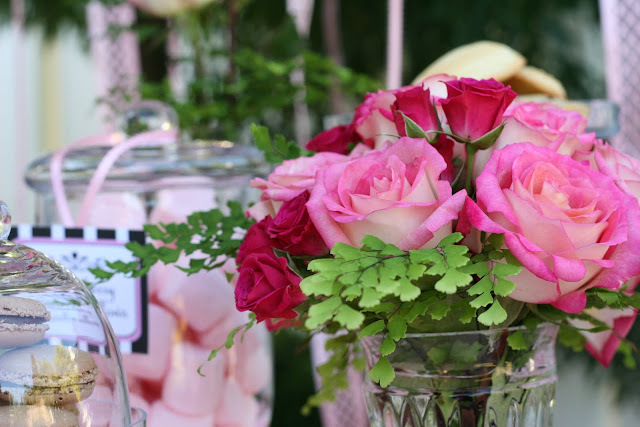 The colors, the sweets…loved it all! The environment you create with these party tables is just magic! btw, do you have an email address on how to reach you? i cant seem to find it here..
Hi,how are you today?I have surfed your blog serveral times, your blog is great and having a lot of intresting things. If you have time, you can visit my blog and feel free to give me some comments! Thank you very much. Thanks for all the nice comments! I really appreciate each one! Feel free to drop me a line anytime! I read my messages everyday, although it may take a few days to reply! Beautiful Glory! France (and Italy, Bali, England, Greece, lol) are on my "places to visit before I die" list too!! Glory this is perfect! I love it! 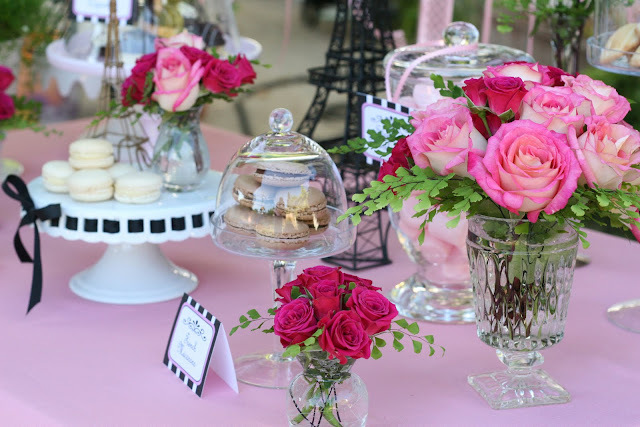 I am designing a table now for the grand opening of my friends salon, it is called Prive (French it means private) she wants it to be a parisian theme….definitely using this for inspiration! Thank you for sharing! This is stunning. So gorgeous….I want to live here. This is such a great thing to "stumble" upon! In two weeks I'm throwing a Paris themed bridal shower for my best friend! 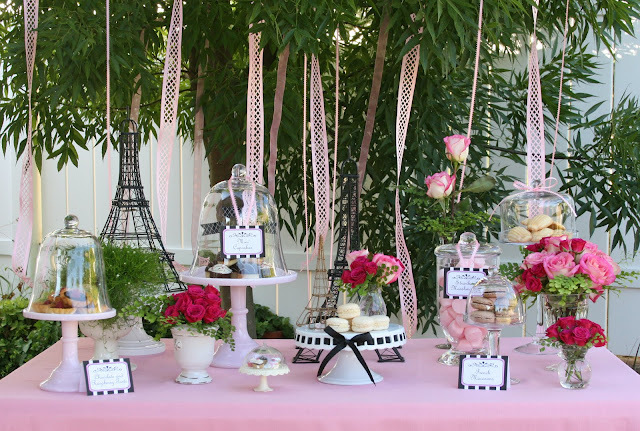 She is in love with Paris and has her house decorated in a Paris theme! 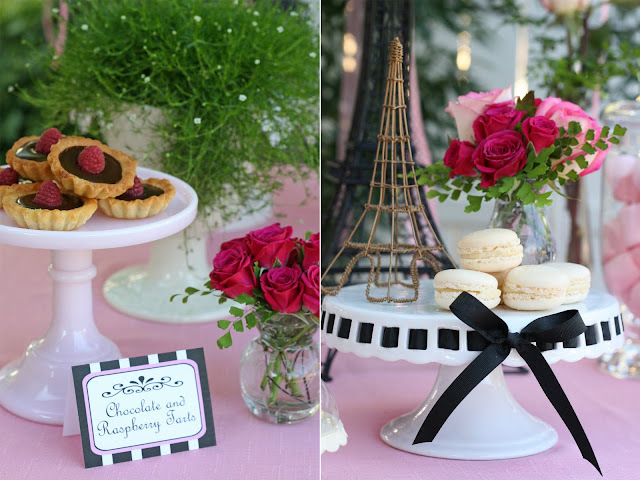 I created pink/brown Eiffel Tower invites…I'm baking Eiffel Tower and Fleur Di Lis sugar cookies, Eiffel Tower Cake, and now you have just helped me decide on a few other desserts!! Thanks for your inspiration! Love your blog! Very pretty, love the details! May I ask where you found your glass cake domes? Home Goods has some of the items in your display (I recognize a cake stand! I absolutely love this! Hanging the ribbons from the trees looks wonderful. Such a lovely job! I am always looking for ideas for the "big girls"! This is classic and lovely! 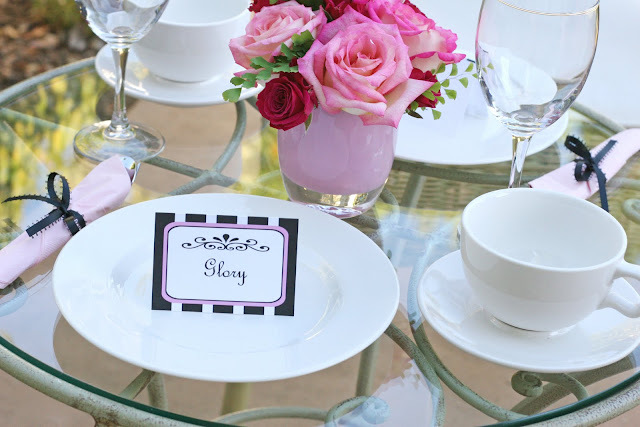 The Paris Tea Party design is so gorgeous and inspiring. I also wanted to know where we could find the lovely domes and stands you used? Thanks for all the lovely comments!! As for the glass domes, I bought them a while back on Ebay. I just did a search now, and found a couple. Search glass domes, or glass cloche. Oh, you have outdone yourself and I love, love, love this! You are so talented. Would you mind if I reposted this on my blog and linked and credited back to you, along with the turtle Rice Krispies? And thanks for the tip on the cloches! Thanks for asking, and yes, you may post some photos from this party and also my caramel rice krispies treats on your blog (but please do not include all of the directions for the rice krispies treats). Thanks for letting me post a couple of pictures. The post will be up tomorrow. 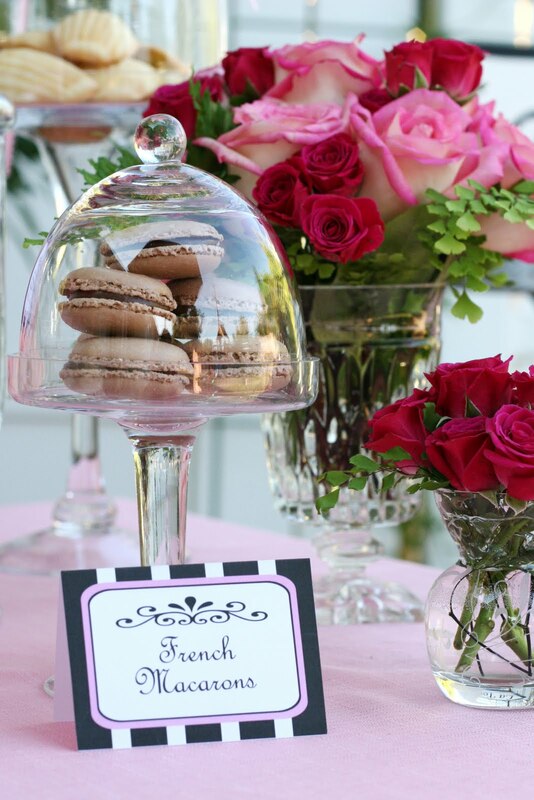 Love the table setting with all the lovely glass domes and cake stands. Oh my! I adore this idea! I must know… how long did it take to pull this together? Hello from France where I look at this blog everyday ! I love what you do , you are a real inspiration for me and I hope you will continue this blog for a long time. 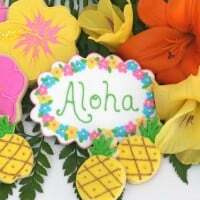 I will follow you again and continue to make wonderful cakes inspiring from yours ! Oh! So serene….Totally in love with the settings and Paris atmosphere…Great work! Thank you very much for all your sweet comments Ashley! Wow. 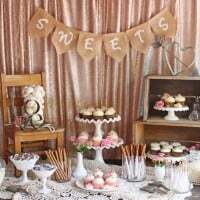 You have such wonderful dessert tables. 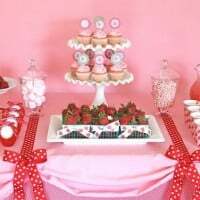 Do you mind me asking how much you charge to spend to make a theme set up? Hi Gloria! I’ve been reading your blog for quite some time now. 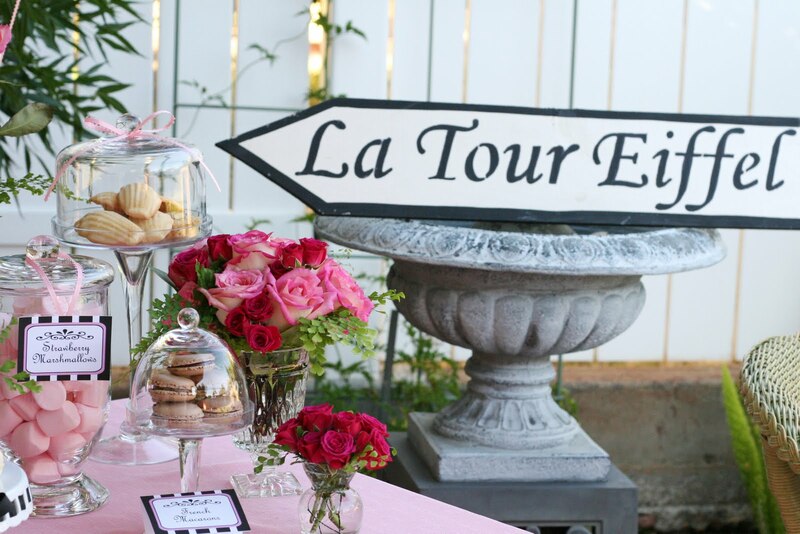 I especially love your cookies and dessert tables! 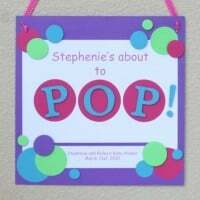 My daughter is turning 6 this May and we’re having a Barbie A Fashion Fairytale theme. I was just wondering if you have any ideas for a dessert table or anything you can come up really. You have a lot of creative ideas and I’d like to get some inputs. Thank you very much! I’m french and live in Paris downtown, but you are The Parisian. My gosh, this is so so, so georgous and so lovely and very chic. Bravo !! and Thank you again.